With our step-by-step foil-pack cooking method, dinner is a snap. And as a bonus, there's next to no cleanup! What's not to love about this cheesy chicken and vegetable entrée? 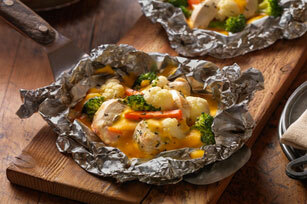 Spray 4 large sheets of heavy-duty foil with cooking spray; top with chicken, Italian seasoning and vegetables. Fold to make 4 packets. Grill 15 min. or until chicken is done. Cut slits in foil to release steam before carefully opening packets. Top ingredients (still in packets) with Velveeta. (No need to refold packets to seal.) Grill 5 min. or until Velveeta is melted. Combine 1/2 tsp. each chili powder, crushed red pepper, garlic powder and ground cumin. Sprinkle over chicken instead of the Italian seasoning, then continue as directed. Prepare recipe as directed, substituting Creole seasoning for the Italian seasoning.